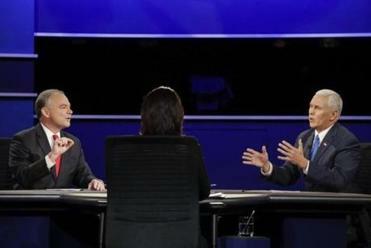 Democrat Tim Kaine and Republican Mike Pence during Tuesday’s vice presidential debate. WASHINGTON — Here are the claims from Democrat Tim Kaine and Republican Mike Pence during Tuesday’s vice presidential debate, and how they stack up with the facts. Read: Are these VP picks irrelevant? THE FACTS: True, but that’s not exactly to his credit. A balanced budget is required by law, as it is in every state except Vermont. THE FACTS: As a share of the total U.S. economy, the national debt has gone up 35 percent, not a doubling. As for Trump, the committee says his tax-cut-heavy plan would increase the gross debt by $4.3 trillion —nearly 10 times more than Clinton’s plan would do. THE FACTS: Pence has been both for and against the Affordable Care Act at different times. He railed against it while in Congress, but one of his chief accomplishments as governor was Indiana’s expansion of Medicaid under President Barack Obama’s health care law. The Healthy Indiana Plan 2.0 uses federal dollars to help provide health insurance to more than 200,000 low-income Indiana residents who get coverage in exchange for paying a small fee. Pence and his allies have presented the policy as a conservative approach to the Affordable Care Act and have suggested it could be used in other Republican-leaning states that have resisted taking federal money under Obamacare. But he’s taken flak over the law from some conservatives who say no matter what it’s called, it is still a big-government entitlement program. THE FACTS: Hillary Clinton also doesn’t have a plan that is materially different than what President Barack Obama is already doing. She’s described a three-part strategy that involves crushing IS ‘‘on its home turf’’ in the Middle East, disrupting its infrastructure on the ground and online, and protecting America and its allies. All are current elements of the Obama administration’s strategy, so it’s not clear what would change or if she would accelerate any portions of it. It’s also the case that Trump has not laid out a clear plan. PENCE: She was the ‘‘architect of the Obama administration’s foreign policy.’’ He said the Middle East is ‘‘spinning out of control’’ and suggested that the ongoing crisis in Syria was the result of a ‘‘failed and weak foreign policy that Hillary Clinton helped lead’’ in the Obama administration.’’ Moreover, he said that that President Barack Obama and Clinton gave Russia room to launch its aggressive moves in Ukraine. THE FACTS: Clinton pushed for increased U.S. intervention after Syrian President Bashar Assad used chemical weapons against rebels. But Obama is the commander in chief and nothing has swayed him thus far. On Russia, Clinton as secretary of state helped seal a nuclear arms-control treaty and secure Russia’s acquiescence to a NATO-led military intervention in Libya. By comparison, Republican Donald Trump has rung alarm bells in Washington and Europe with his overtures to Russia’s authoritarian leader. Clinton and her supporters say she would be far tougher on Moscow than Trump, whose unusual foreign policy statements include musings about NATO’s relevance and suggestions that he could accept Russia’s annexation of Ukraine’s Crimea region. 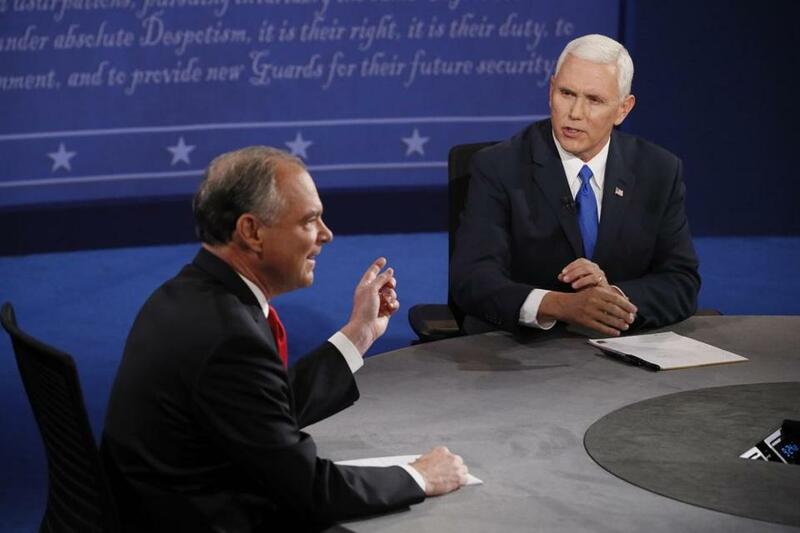 ‘‘You guys love Russia,’’ Kaine said, reminding Pence that he and Trump have praised Russian President Vladimir Putin as a great leader. THE FACTS: The idea of potential racial bias in police departments has become a center of concern among law enforcement officials across the nation. Police departments are increasing implicit-bias training for their officers, including in large cities where protests over the over the killings of black men by white officers sparked a debate about the role race plays in policing. Experts say the focus on implicit bias is the next frontier of police training and the Justice Department has increasingly pushed for implicit bias training at troubled law enforcement agencies. THE FACTS: Hillary Clinton’s immigration plan is certainly similar to a bill signed by President Ronald Reagan in 1986. But Clinton’s proposal would offer a path to citizenship for immigrants living in the country illegally and would have far broader impact. The estimated population of immigrants living in the United States illegally is now roughly 11 million. In 1986, the so-called Reagan amnesty bill legalized the immigration status of about 3 million people. There are also some notable differences between the so-called amnesty bill signed by Reagan and Clinton’s proposal. The Reagan bill included a provision that made it illegal for businesses to hire workers who don’t have the legal right to work in the United States. Enforcement of that provision has never fully materialized. While Clinton’s proposal does include a proposal to deport criminal immigrants, the plan also includes a plan to roll back a law that bars most immigrants who had lived here illegally from returning after either deportation or voluntarily leaving for three or 10 years, depending on how long the person had been living here. That provision actually became law in 1996, while President Bill Clinton was in office but was considered a follow-on to the bill Reagan signed. THE FACTS: Rather than send funds to other charities, the Clinton Foundation tends to spend its money on its own programs. Pence’s claim ignores these internal initiatives, overlooking the Clinton Foundation’s work on African farming, climate change and AIDS treatment. As for Trump’s foundation, news reports have raised multiple questions about its namesake’s generosity. Funds have been used to buy paintings of Trump and a signed football helmet that belonged to Tim Tebow. Money from the foundation has also reportedly helped settled legal cases against Trump’s for-profit businesses. Trump even paid the IRS a $2,500 penalty this year after it was uncovered that the foundation broke tax laws by giving a political contribution to Florida’s attorney general. Trump also has praised Putin, marveling that the Russian leader has an ‘‘82 percent approval rating’’ and insisting that he’s ‘‘a leader, far more than our president has been.’’ Putin has elicited worldwide criticism for the Russia’s annexation of Crimea and its support for Syrian President Bashar Assad.